Tega Cay is having it’s third food truck rally and concert of the summer this Saturday, August 18th. If you love food truck cuisine and are looking for something fun to do on Saturday, why not head out to Tega Cay? 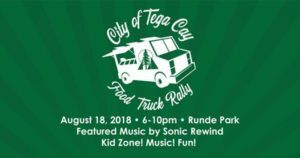 If you’re looking for something fun to do this weekend, why not check out the Food Truck Rally and Concert in Tega Cay on Saturday, August 16th from 6:00 pm till 10:00 pm? Sonic Rewind , Charlotte area’s premier classic rock band, is the featured band for the evening’s festivities, performing 50 songs from the 1970’s and 1980’s. Performing with Sonic Rewind is one of my favorite clients, Allison Rose, a hugely talented vocalist and dancer. Something to tickle the taste buds of just about anyone. No BYOB, but beverages can be purchased on-site, provided by SC Shore Club/City Tavern. Tega Cay hasn’t forgotten about the kids… there will be a kid’s area with bounce castles for kids of all age groups. Location For Tega Cay Food Truck Rally & Concert: Runde Park at 5116 Windward Drive. No dogs or grills, please. More information about the Tega Cay Food Truck Rally and Concert on Saturday, August 18th. This information about the City of Tega Cay’s Food Truck Rally and Concert is provided by Nina Hollander and Carolinas Realty Partners, RE/MAX Executive, your Charlotte metro area residential real estate experts and Tega Cay, South Carolina specialists. Tega Cay, South Carolina's third food truck rally and concert of the summer this Saturday, August 18th. If you love food truck cuisine and are looking for something fun to do on Saturday, why not head out to Tega Cay?